High-Tech TVI systems complement the line of packaging machines from Multivac. The smart connection between the digitally interconnected units in accordance with Industry 4.0 principles and management from a single central control unit allows for the maximum efficiency and complete safety of the process. All line components are perfectly integrated. 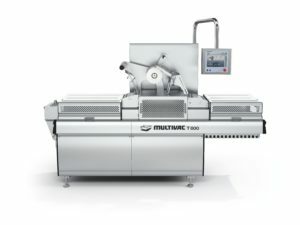 At Meat Tech, Multivac presents a complete line consisting of a GMS 520 single-cut multifunctional portioning system, a completely automatic AIR 520 flex-load TVI system, and a MULTIVAC T 600 L traysealer (in the picture). The T 600 L is MULTIVAC’s smallest fully automatic tray-sealer with belt feeding; it can be easily integrated into a packaging line. Suitable for packaging small and medium-sized batches, it features advanced energy-efficient drive systems. It is also designed to be completely washed down and allows for a quick and safe die change. Thanks to the IPC06 machine control with touch-screen, its operation is very user-friendly. The machine can be set up and equipped according to individual needs.